ProAudit is your source for industry-leading accounts payable recovery services! We are pleased that you have visited our World Wide Web page. Please stay awhile and explore this site to learn more about our company and its unique financial services! It is a very good question to ask. Click Here to find out the specific reasons WHY our clients look at our service as a benefit to their own agendas and goals! 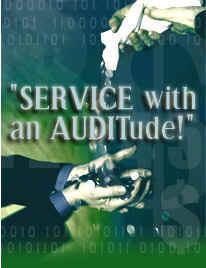 ProAudit Gazette is our own proprietary newsletter for our corporate staff and field associates. Please Click Here to see a few of the topics we have covered recently. If you would like a copy of any particular article, please email us and we will be happy to send it to you! Design by Lunar Media Inc.